Split peas, lentils, pasta and sun dried tomatoes make a hearty combination for this delicious soup. Makes approximately 6 (1 cup) servings. Add contents of soup package to 6 1/2 cups of boiling water. In a separate frying pan, sauté chopped onion and garlic in 3 Tbsp. olive oil until translucent. Set aside. After 20 minutes, stir in the cooked ham or sausage and onion/garlic mixture to the soup pot. Bring to a boil. Immediately reduce heat to low. Cover and simmer an additional 10-15 minutes. 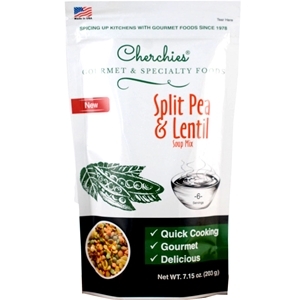 Split peas, lentils, enriched macaroni product, salt, sugar, hydrolyzed soy protein, dehydrated vegetables (onion, garlic, parsley), spices, oleoresin turmeric, spice extractives. (Silicon dioxide added to prevent caking). Allergens: Contains wheat and soy.